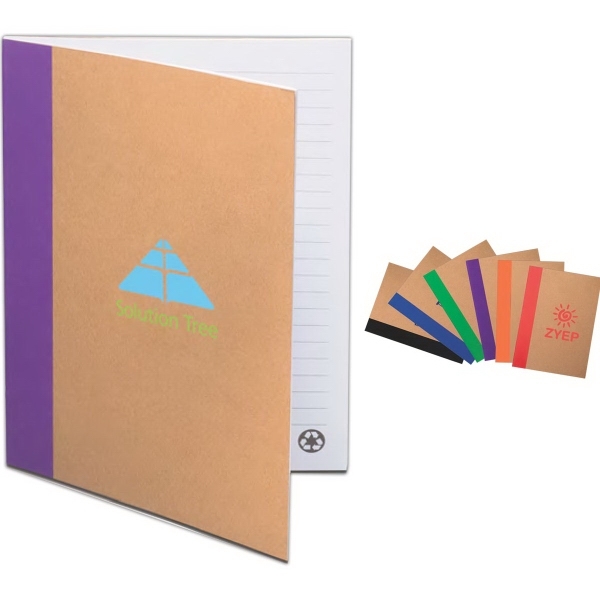 Features a coated cardboard with 50 pages. 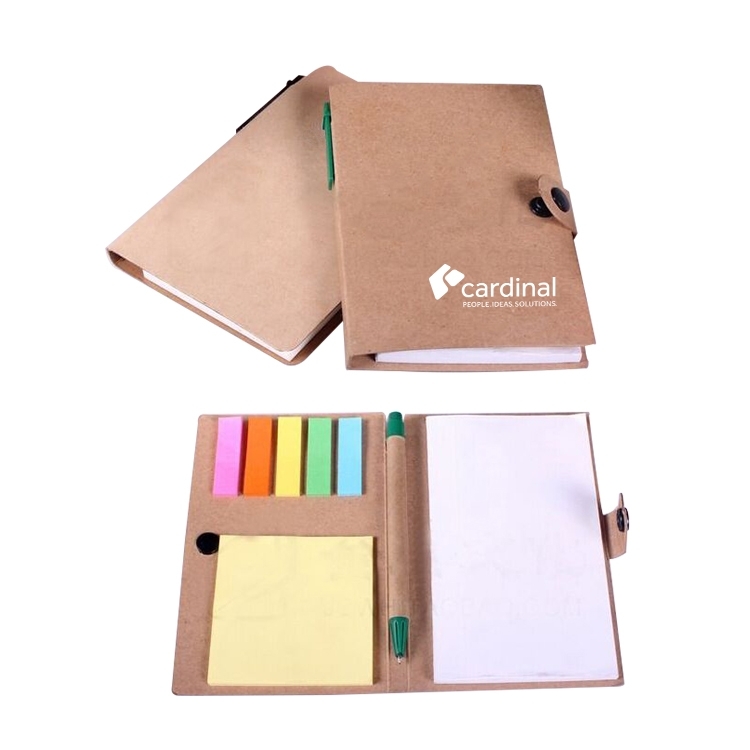 It has a double metal loop wire binding and an elastic pen loop with a pen. 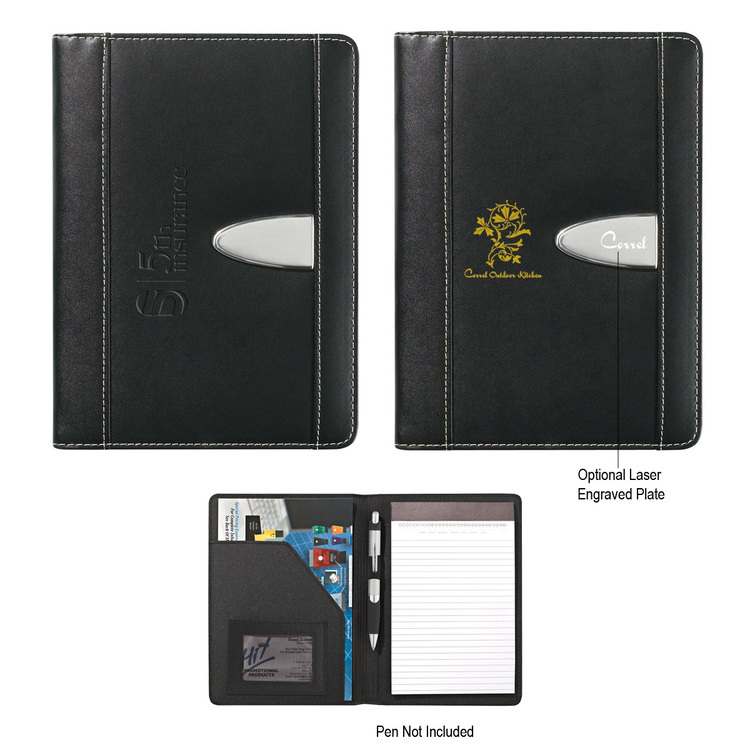 Add your custom full-logo imprint for instant brand recognition. 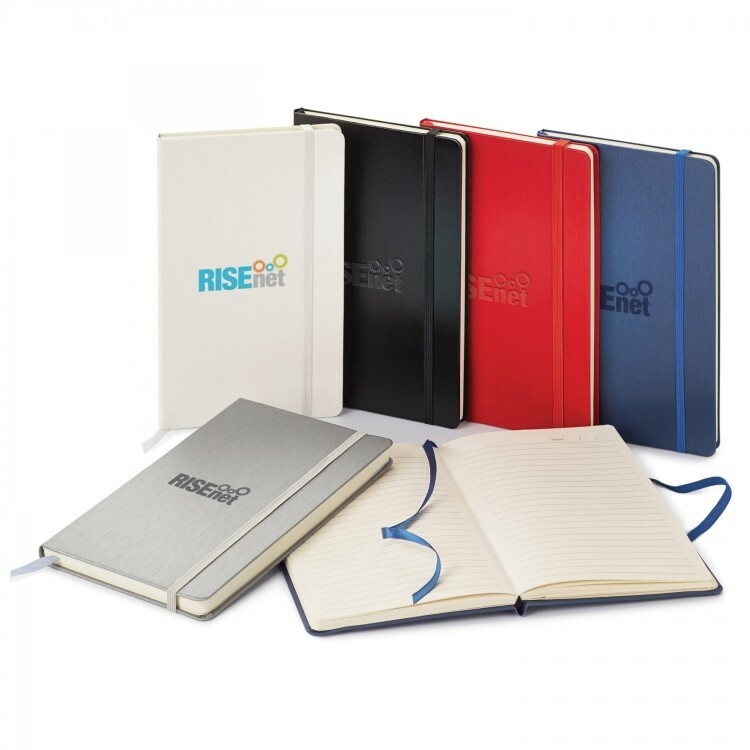 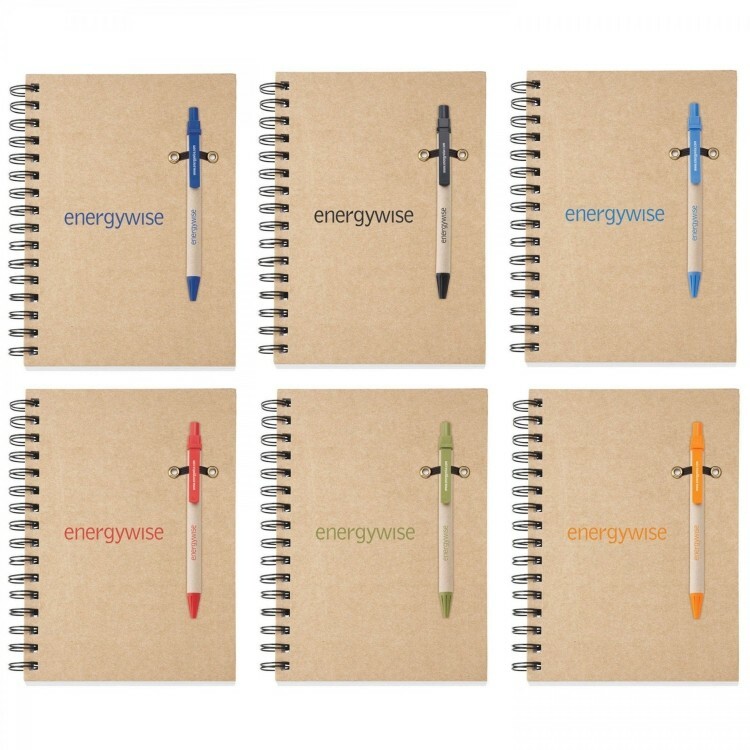 With a lifetime guarantee, this product is the "write" choice for your business! 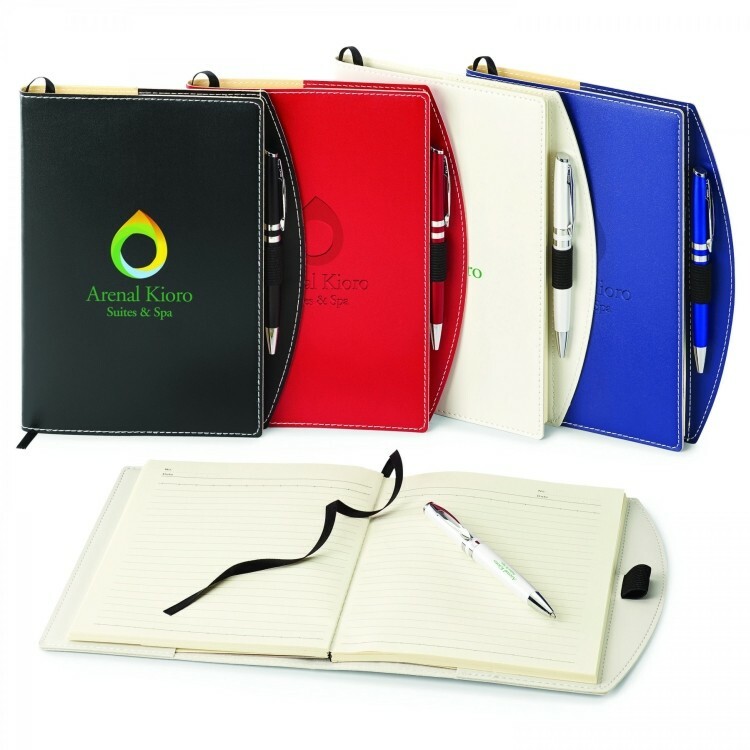 Pen can be blank or imprinted with custom logo, additional setup charge may apply. 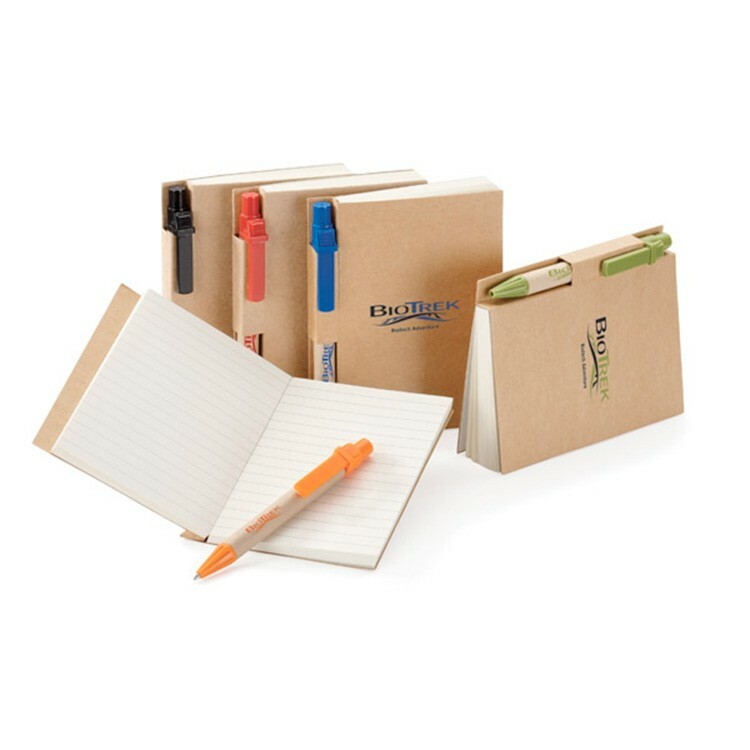 Due to our high standards of quality control, we must advise that slight irregularities in the cardboard of these pens may result in imperfections in barrel imprints. 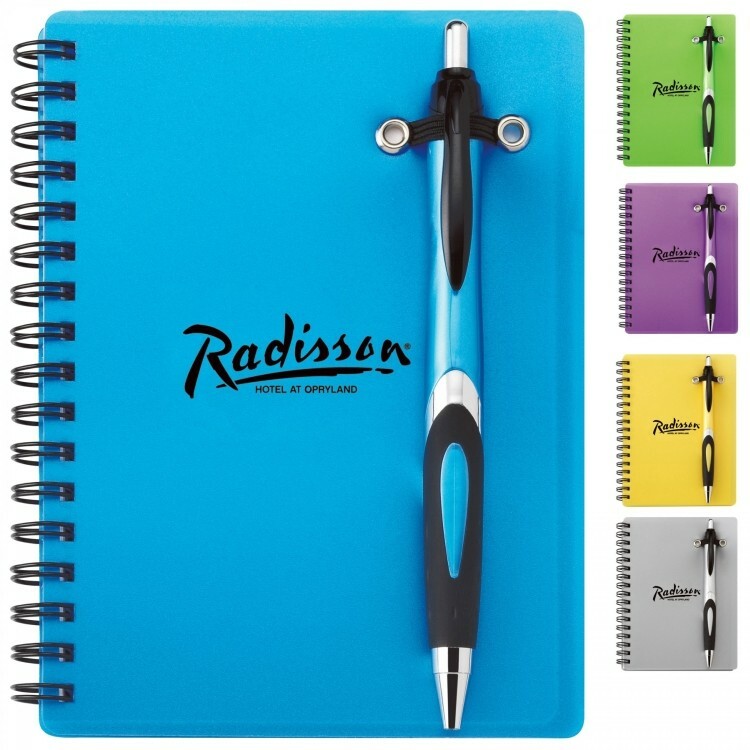 Combo includes ST2061 Candy Coated polypropylene notebook with 160 white lined pages (non refillable) and a matching G1079 Helix push-action ballpoint plastic pen. 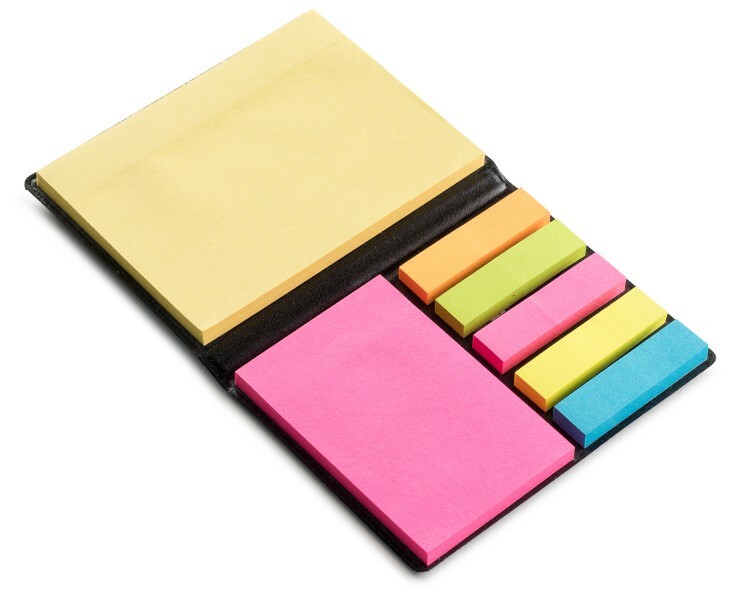 Black Leatherette PVC Memo/Stick Gift Set: Includes yellow sticky notes, smaller pink sticky notes and 5 colors flags. 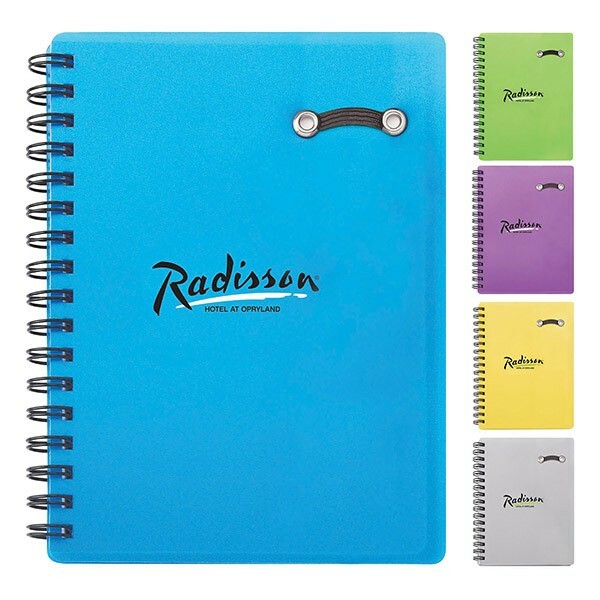 50 sheets per color. 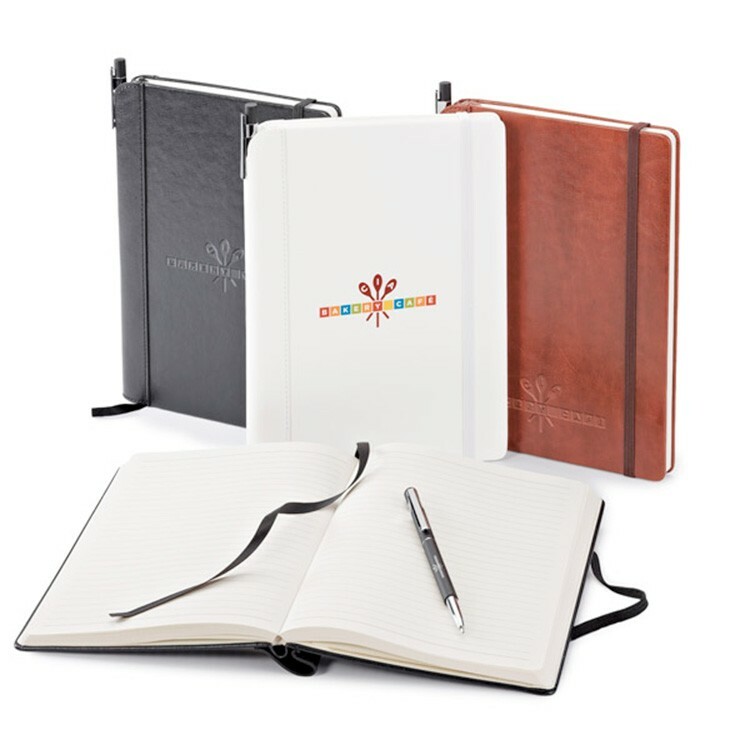 With custom full color printing, your logo can be illustrated from the front to the back of the cover of this soft touch journal. 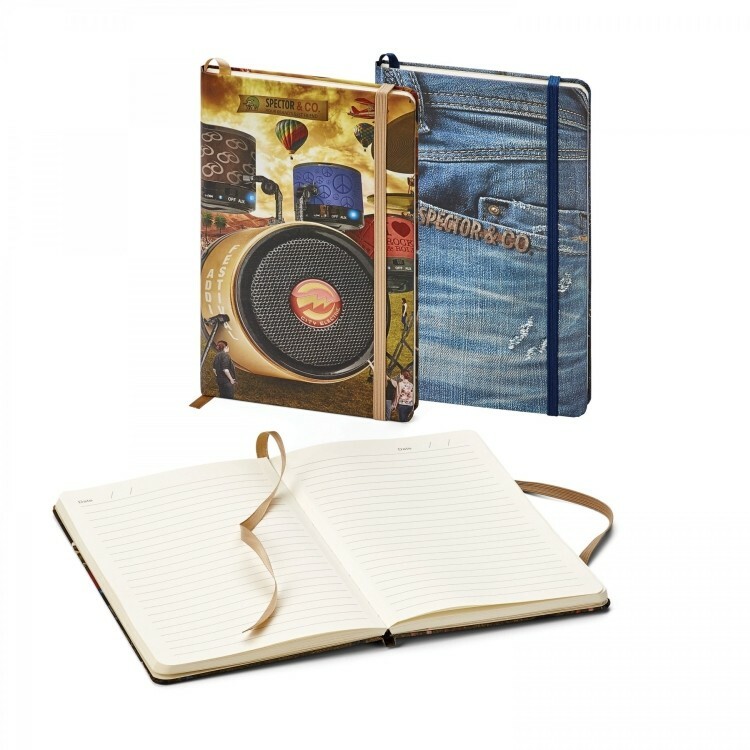 The non-refillable hardcover journal has 160 perforated ivory lined pages with a ribbon bookmark, elastic closure and a gusseted pocket to neatly store all your paper notes away. 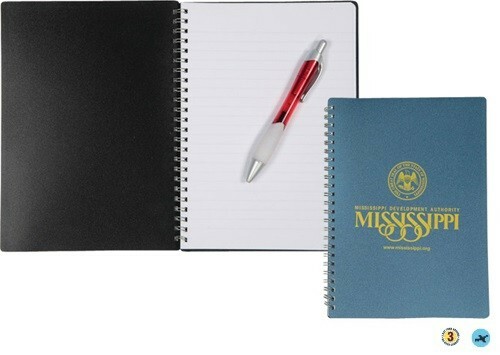 5" x 7" Perfect Poly-Fabric Cover Notebook with calendar. 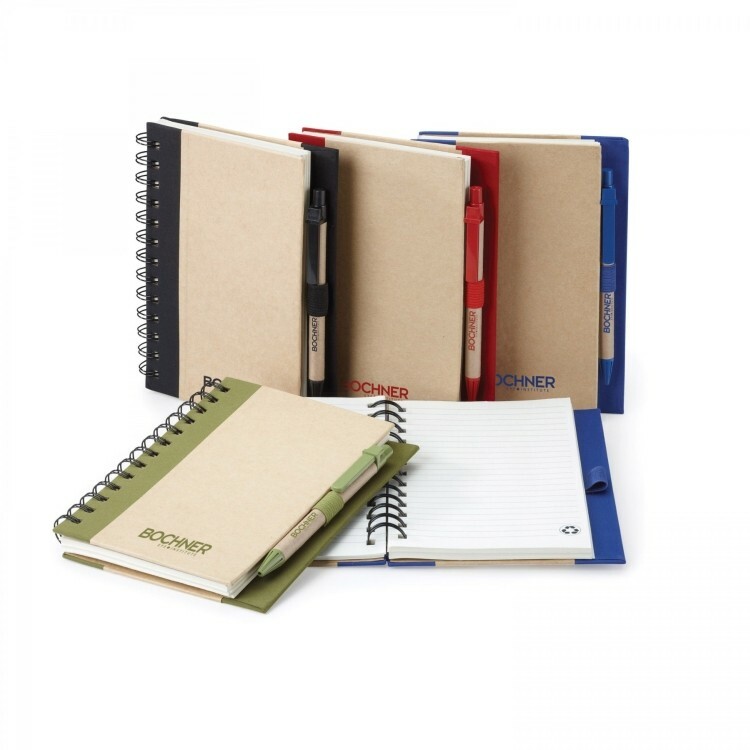 Perfect bound notebook with lined pages. 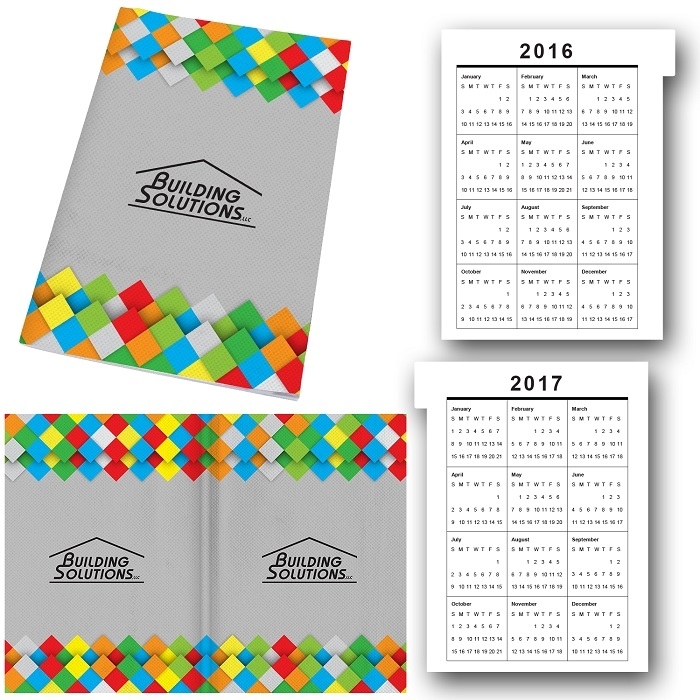 Full color poly-fabric cover. 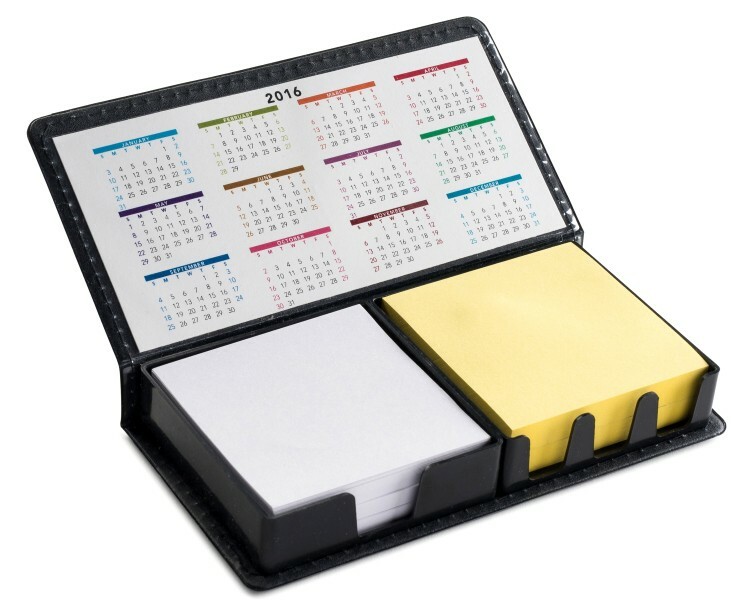 Includes calendar page. 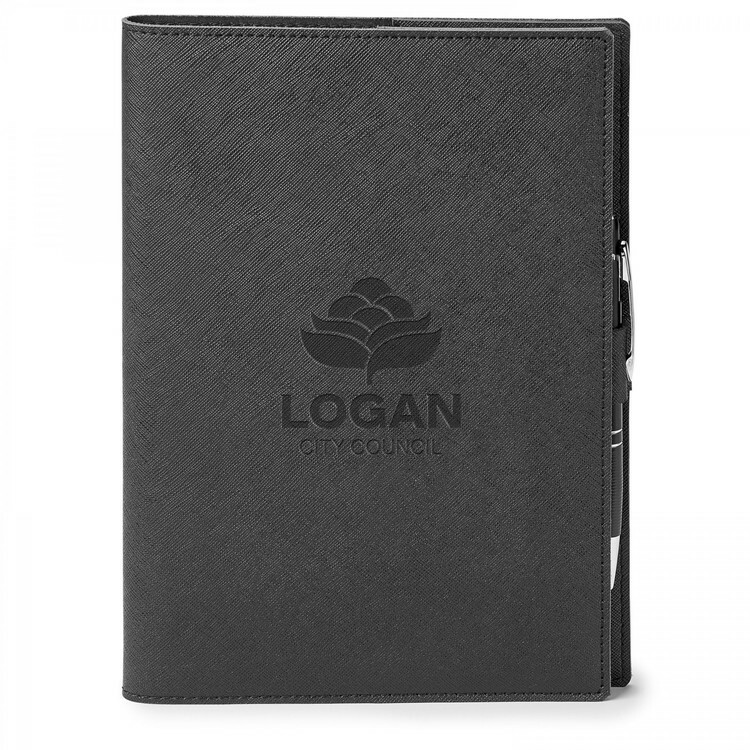 Slim design, turned edges and rounded corners make it easy to slide this junior portfolio into any briefcase or attaché. 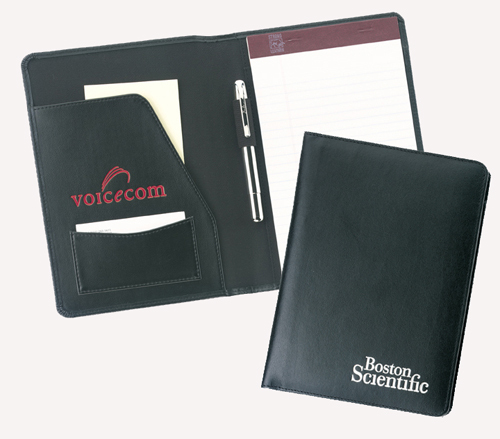 Affordable bonded leather with Strong quality make this promotional piece easy to fit into any budget. 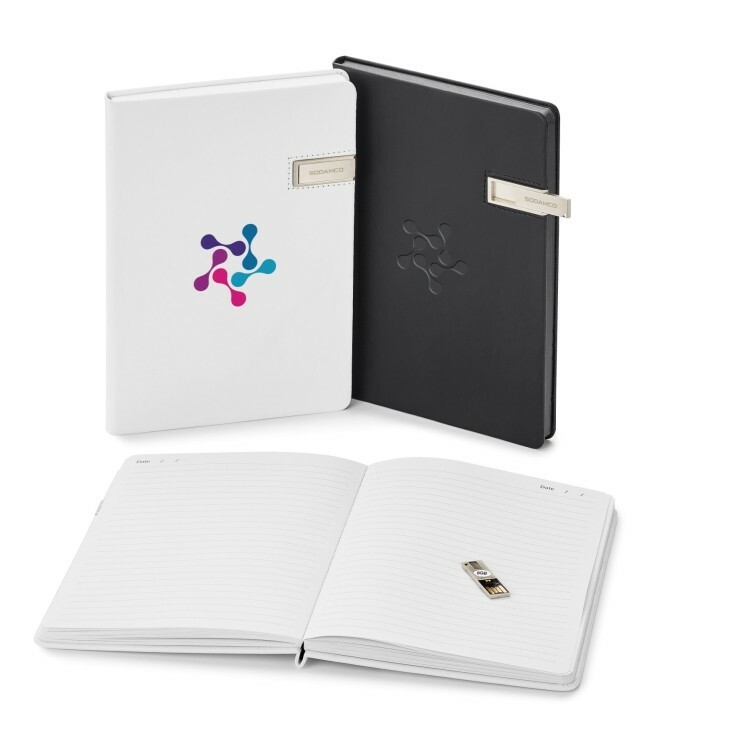 There?s even a combo option already stocked with the ST4670 journal 6 1/2" x 9 1/2" (refillable) and the I128 black Glacio aluminum pen/stylus in a 2pc black gift box, waiting to be adorned with your logo. 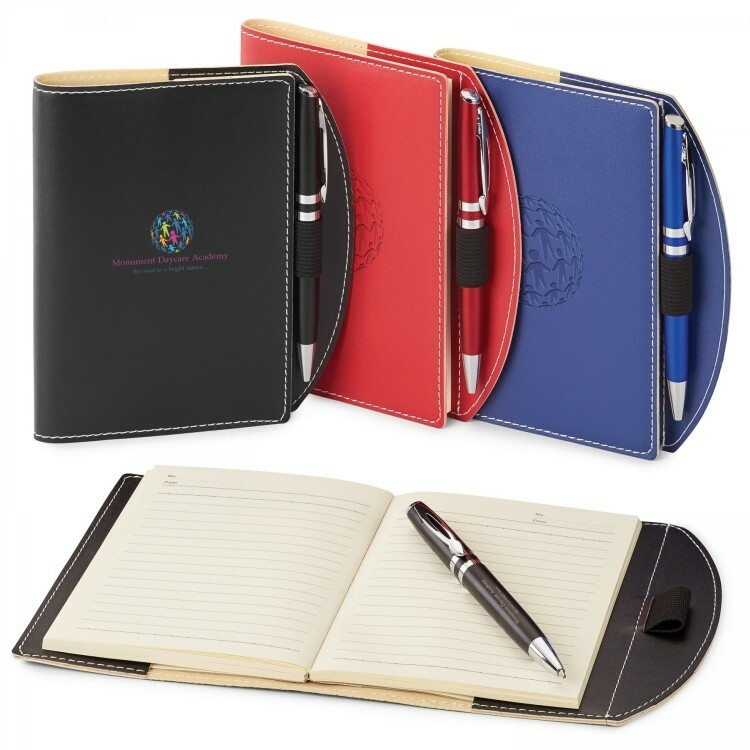 Portfolio case with retractable handles. 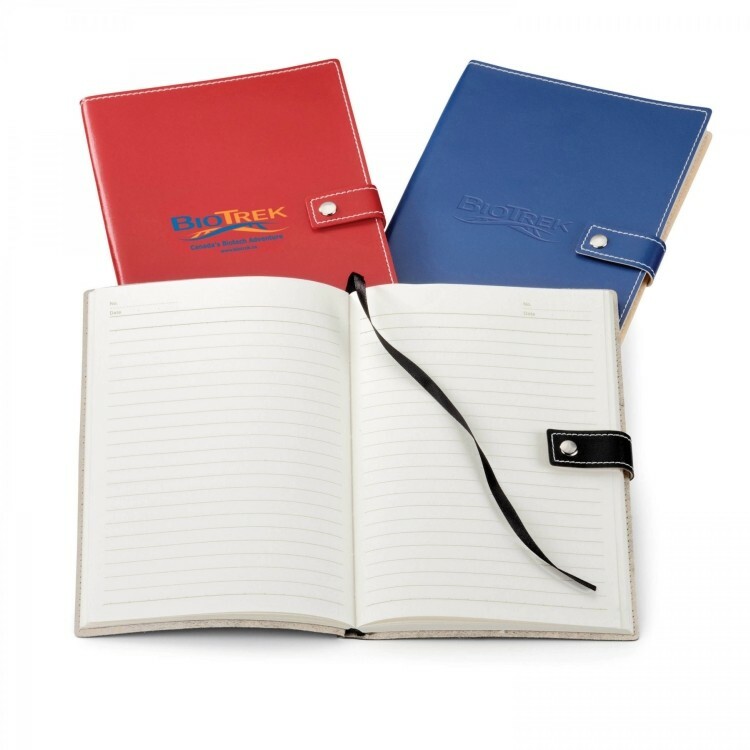 Premium simulated leather material. 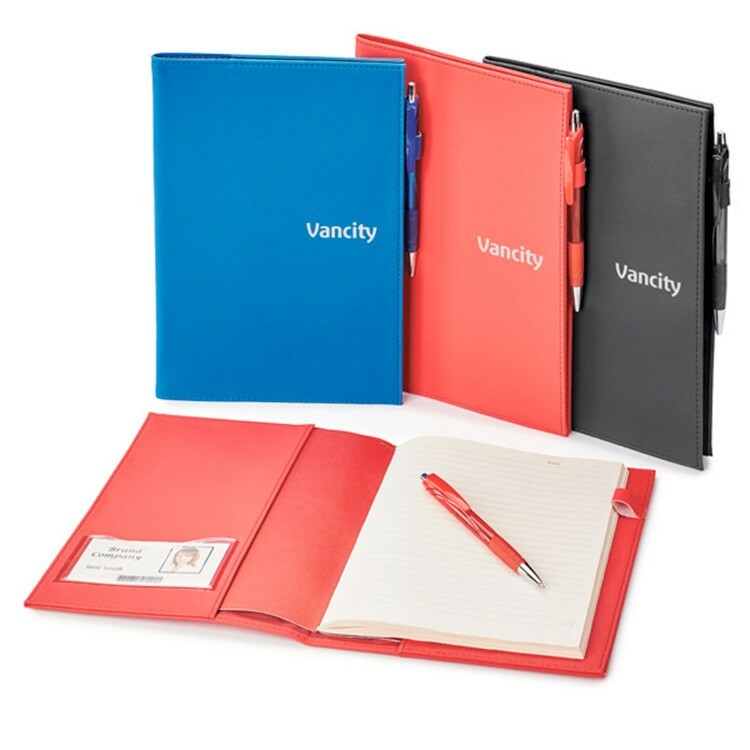 Features a stitched, padded cover with zipper closure, interior organizer with Expandable File Pocket (holds Tablet or iPad), Electronics/Accessory Pocket with Zipper Closure, Exterior File Pocket and Hideaway Handles, 1" 3-ring binder, Writing Pad and Pen Loop. 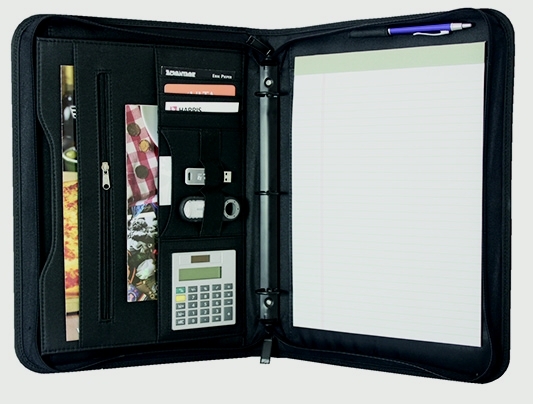 This ring folder also features 3 USB loops and a 8 digit dual power calculator. 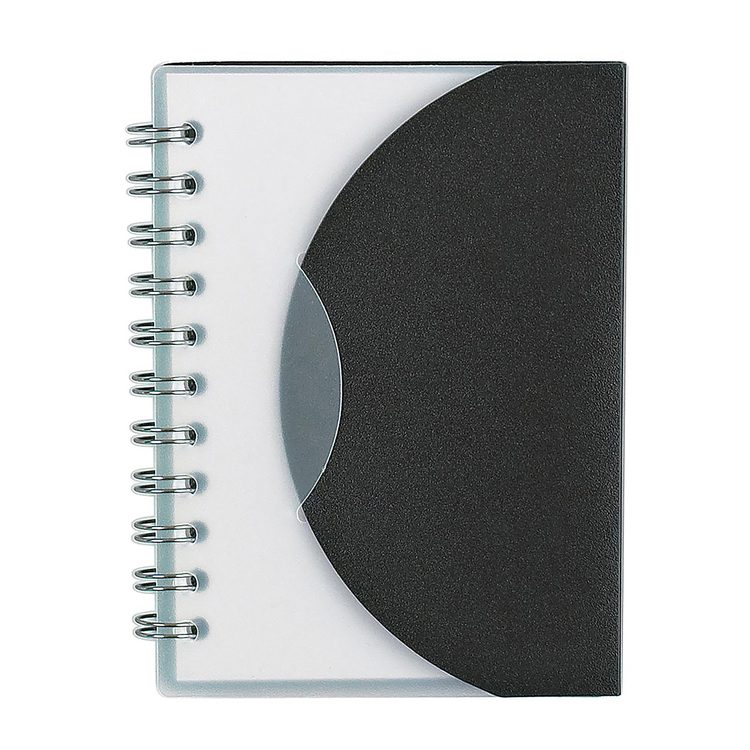 This item can be screen printed or blind debossed (up to 12 sq inches for blind deboss). 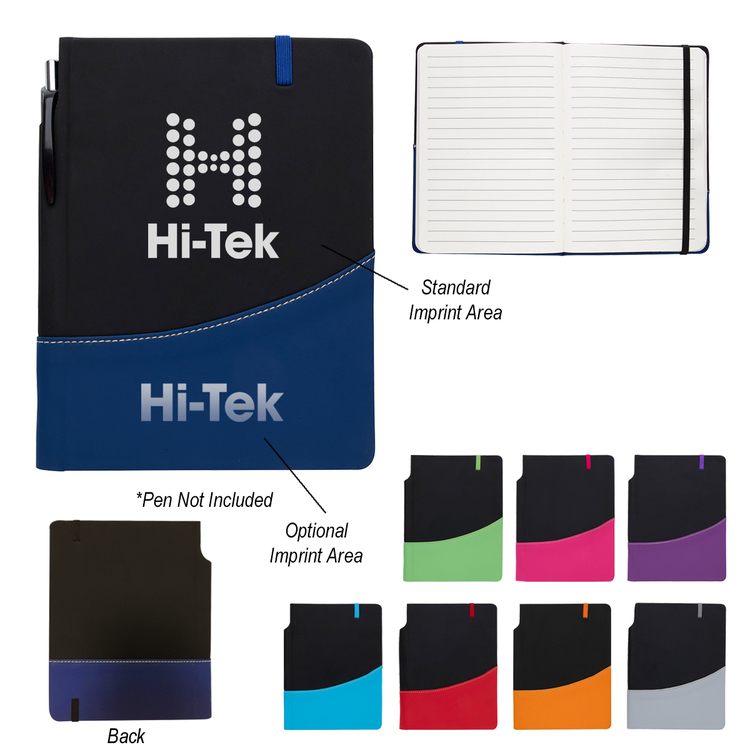 Screen print area: 5" W x 3" H (Front and/or Back) Deboss Area: 4" W x 3 1/2" H Standard Deboss Size: Up to 12 sq/inches • Deboss Plate Charge: $70.00(v) up to 12 square inches, $2.50(v) for each additional square inch, max 18 square inches • Screen Set-Up Charge: $45.00(v) per color/location • Reorder Set-Up Charge: $20.00(v) per plate or color/location • Unimprinted: 1-2 Days Production Time. 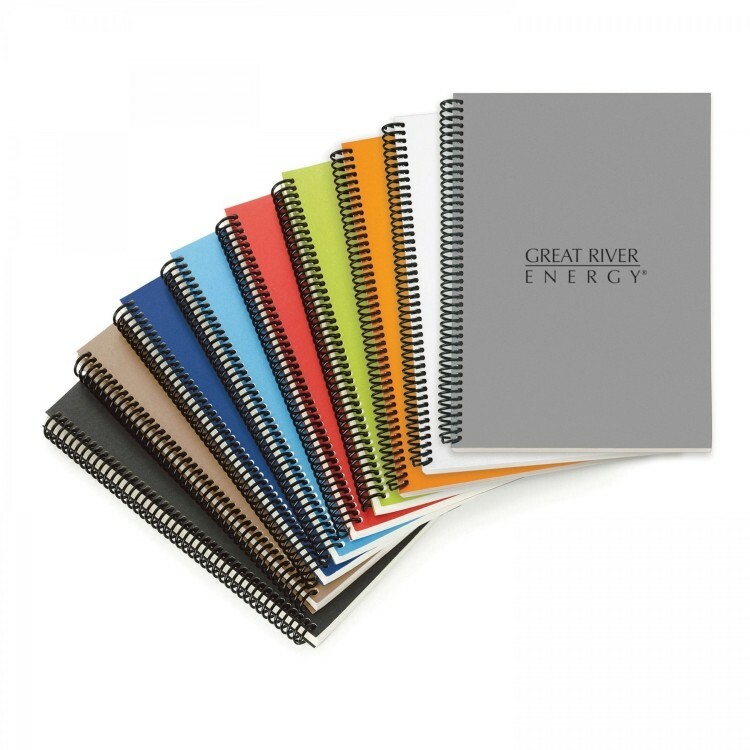 NOTE: When branded, the standard imprint location is centered on the front cover between the spine and the elastic closure. 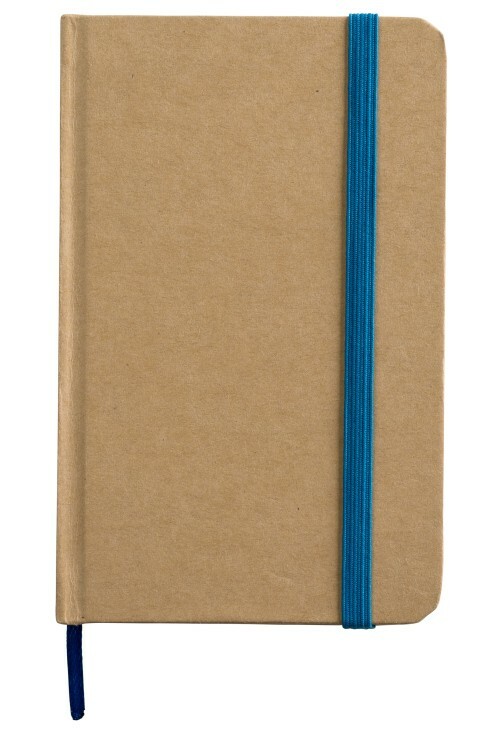 Please specify if you would like the imprint to be centered on the front cover between the spine and the right edge. 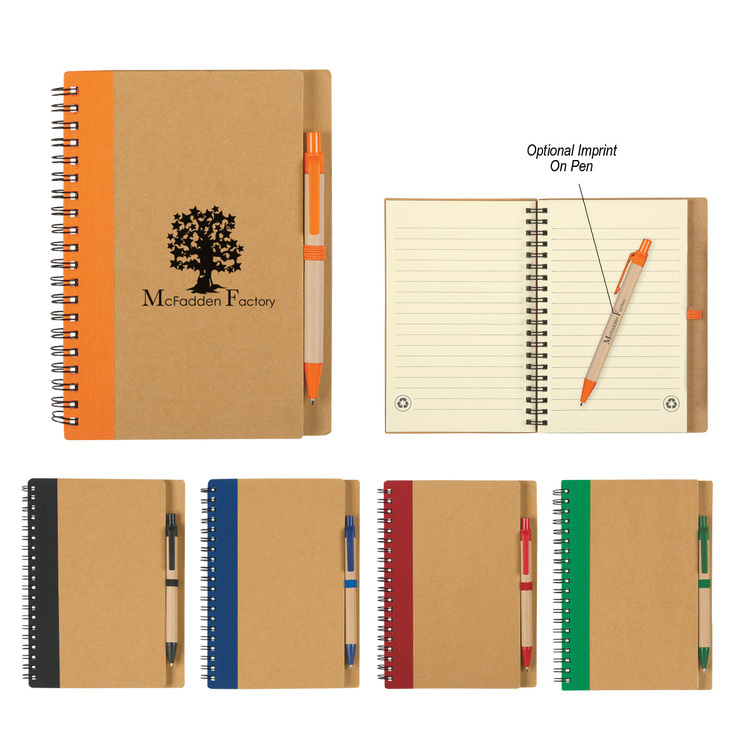 100% BIODEGRADABLE! 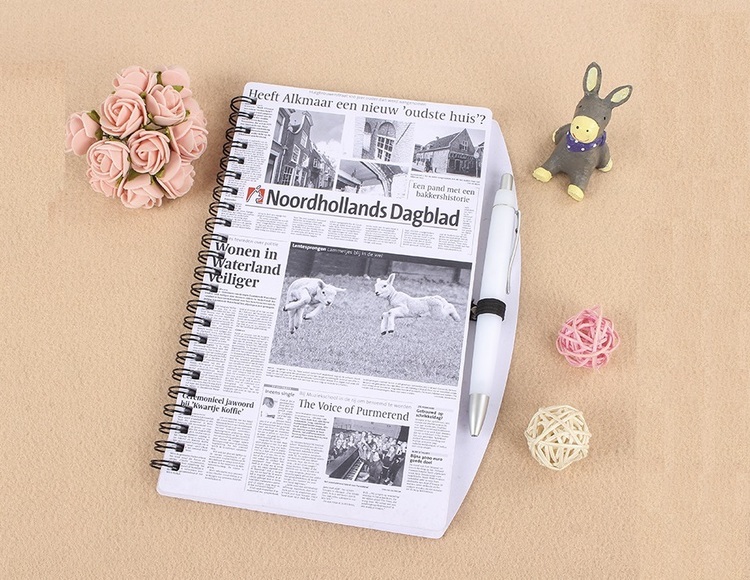 - Film vinyl with sealed construction and Patented Expand-A-Pocket with ruled writing pad.